Price: $14.59 ($16.88 incl. taxes & deposit) *this wine is on sale to $13.59 for the month of Aug. I get a strong sense that consumers are starting to look for more finesse in their wines. They are starting to move away from the big boozy juice bombs that laden the liquor store shelves. Inevitably this leads the consumer to European wines for the most part and if that path leads to Italy it likely means tasting wines made from grapes that are not household names. This wine is just such an offering. It hails from the Alto Adige region of Northern which is nestled in the Dolomite mountains, and is a blend of Teroldego, Lagrein and Merlot. See what I mean. I have been tasting wines for 20+ years and I can only recall tasting Lagrein once or twice and I have never had the pleasure of tasting Teroldego. I poured a glass right after pulling the cork. I loved the perfumed, berry, floral nose but the wine seemed really shy on the palate to the point where only its structure was at play. I put the wine aside for a couple of days and that did the trick. Clearly this is a wine that needs a lot of breathing (Vinturi, decanting, or simply leaving it open for a good amount of time) because it totally opened up and showed bright fresh berry and plum fruit flavours along with floral and spicy notes. The finish didn’t show any of the harsh tannins I noted on the first pass. I loved this wine… after a few days. I would have scored this wine higher but the reality is that most people want to dive into their bottle and don’t purchase their wine to have two nights from now. So in terms of real life value its okay. In terms of cork dork value, this is awesome! Food: Steak, roasted meats, cheeses, rustic breads. Could work for Foodie foods and comfort foods. May is not only glorious for weather here on the West Coast of BC, but May also brings the first Grand Tour of the Pro Cycling Season – Giro d’Italia. The third week of the Giro is the toughest week as it winds its way through the hills and mountains of Tuscany. In light of this fact, and that I am serious fan, I thought I would test run a wine that has long been on the market here in BC – Monte Antico. The Monte Antico has great, rustic, old school packaging and is, now, conveniently, under screwcap, which I really like for wines under $20. Tasting Notes: The colour is dark crimson and the nose shows dark cherry, leather, earth, and savoury spices. The palate shows similar flavours but has added the added complexity of plum and raspberry fruit flavour, hints of dried cocoa and pepper. The palate is of mid-weight and can stand up to most comfort foods from grilled chicken dishes to steak. The finish is round and juicy leaving you with the delicate marriage of cherry, plum and spice flavours. Value: As much as I enjoyed this wine, I found that I wanted more out of it for the price. It certainly has more complexity than the big brand names out of California, and the flavours are well honed, but I would have rated it much higher if the price was a buck or so lower. Added Value: This wine has added value as a pairing for Comfort Foods, as a BBQ wine and for those looking to venture into the wines of Italy/Tuscany for the first time. Food Pairings: Comforts such as pizza, pasta, grilled chicken or steak, casseroles, firm cheeses, lasagne, Mac ‘N Cheese and cold cuts. You have heard the phrase ‘The whole is greater than the sum of its parts’? That is how the wine growers and makers of Veneto region have been approaching wine for over two millennia. This wine is a reflection of that tradition but with a modern twist. This is a blend of Merlot & Corvina which until recently would have been unthinkable… even in the wine world, steeped in all its traditions, has rebels within it. Tasting Notes: Nice plum, cherry and blueberry aromas and flavours. Touches of savoury herbs and licorice don the finish. The texture is very soft. Pillowy soft you might say. I liked it but like a pillow, it met my expectations and did its job well, but was rather unremarkable. Value: The value here is for those looking to turn their brains off, and just sink into a quiet glass of wine. 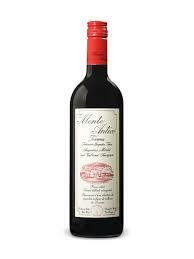 Added Value: This wine would shine best for those looking to delve into the variations of Merlot. Not only will you get a great representation of Merlot grown in the Veneto, but also how Merlot works with Corvina. This is also a great wine for burgers and meats done with BBQ sauce. Food Pairings: Burgers with all the fixins. Grilled or slow roasted meats. Medium but flavourful cheeses. a few times and you are good to go. Appellation: Veneto – Veneto is in North Eastern Italy and is home Bardolino, Valpolicella, Amarone and a lot of Prosecco. It is a great place to travel through as it features rolling hills, lakes, mountains and stretches to the sea and the city of Venice. 2013 vintage was fair to good as vintages go but the 2012 is the vintage you will find for most reds right now and it was a pretty damn good vintage. Best vintages in recent years have been 2010 and 2006. There are still some Amarones floating around from these vintages and they are truly outstanding. About the Wine: Classic Merlot nose of plum and spice. Dark purple in the glass and the palate is ripe and round with flavours of plum and hints of black currant. The finish is juicy, with soft tannins and has a medium length. Value: The simple economics of operating a winery makes it really difficult to produce a quality BC grown wine for under $20, so I have to give this wine some kudos for being able to deliver this kind of quality to the market year after year. To that end I would likely save a buck or two and pick this wine over Fetzer Merlot or $15-$17 Chilean Merlot. Would I trade up from $12 South American Merlot? Yes if it was straight merlot, not likely if Carmenere was in the blend. In fact I would choose a $12-$14 Chilean Carmenere over this wine. Added Value: This wine has added value for those having a BBQ or looking for a Crowd Pleaser wine for when the family comes by. More To The Story: This wine is indicative of the unique character of the wine business in B.C. The identical wine is sold under two different labels. One label, Reserve, is for BC Liquor Stores and the, Black Label Series, is for private stores. The craziness of the current system means that a wine sold to BC Liquor Stores isn’t worth carrying in private stores, so for the winery to gain distribution in private stores they had to create a second model. It is the the BC liquor industry’s version of a TV model for Future Shop and one for Wal-Mart, although they are the exact same TV. Service: Twist the cap and serve. No need to breathe just let it rip. As for food I would serve this with grilled steak or a roast chicken. You are currently browsing entries tagged with Merlot at Dorkuncorked's Blog.